This is an op-ed by Ruth Romer, Private Sector Adviser for WaterAid, London. WaterAid is an international non-governmental organisation focused on providing water, sanitation and hygiene for all. It has programmes in 34 countries in Africa, Asia, South America and the Pacific Region, where it is helping poor communities to establish sustainable water supplies. The global garment sector accounts for two percent of the world’s GDP and can therefore drive change at great scale. It has the capacity to make huge impact – both positive and negative – upon environmental, economic and social issues. If the sector is serious about improving labour rights and decent pay, whilst also boosting the bottom line, it must now focus on the role played by improving access to water, sanitation and hygiene for its workers throughout the supply chain. Business leaders and key fashion brands such as H&M and Nike took steps towards better working conditions at the World Economic Forum at Davos in January, when they signed up to the CEO Agenda 2019, which upholds human rights in the workplace. However, the Agenda omitted access to water, toilets and hygiene for workers from one of its core pillars, which is a crucial oversight. The role that these three facilities play in ensuring ‘respectful and secure working environments ’ is fundamental – without them, any positive changes will be seriously diluted. In Bangladesh, for example, where the garment industry dominates the economy, many workers both live and work in inadequate conditions without any clean water to drink, a decent toilet, or somewhere to wash their hands. The resulting ill health – either their own or of their children – means they are forced to take time off. At work, they may feel ill and comfort breaks are frowned upon, leading to a fall in concentration and a rise in accidents and mistakes. The lack of safe private toilets at work has a detrimental impact on the mainly female workforce, particularly when they’re menstruating. To define and prove the significant return on investment that companies could gain by investing in water, sanitation and hygiene in the textile supply chain, WaterAid, with support from Diageo, Gap Inc. and Unilever, has developed a guide ‘Strengthening the business case for water, sanitation and hygiene’. The guide is being piloted by Diageo, Gap Inc. and Unilever, and is currently being tested by HSBC. 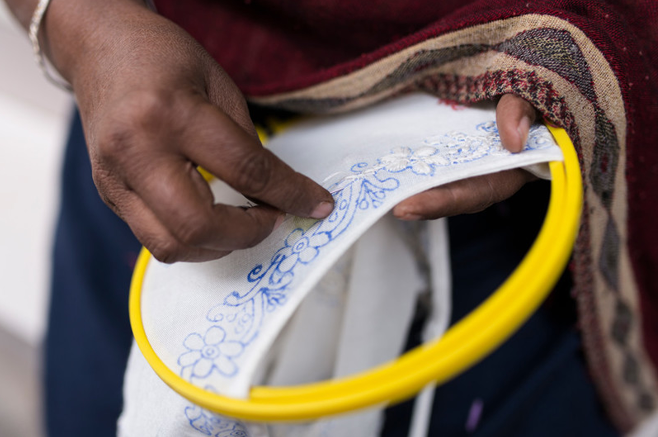 In June 2018, as part of the ‘Sustainable Supply Chains Programme’, HSBC and WaterAid launched a new three-year project to deliver essential water and sanitation services in 24 apparel factories and the communities where the workers live in Bangladesh and India, from small artisanal workers to large-scale textile and leather factories. In addition to improving living and working conditions for employees, this funding will enable WaterAid to provide vital evidence of the financial value of access to water, sanitation and hygiene in terms of business benefits to encourage other companies to invest in these basics. 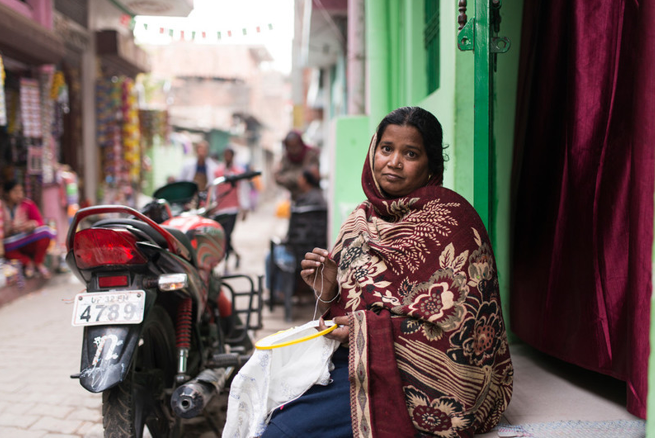 Zarina, 40, lives in one such artisanal community, the Bharat Puri slum settlement in Lucknow, northern India. She makes a small income from her beautiful ‘Chikan’ embroidery, as do most families in this community where there are currently just two toilets for approximately 4,500 people. It takes Zarina two days to embroider a top, and for this she will earn around 100 Rupees; in one month she can earn 1000 Rupees, approximately £10. However, if she falls ill – often with diarrhoea caused by drinking dirty water or being unable to wash her hands – she can’t produce her work on time and so receives no payment from the buyer. Haseena Bano, 35, lives in Budhiya Ghat, a slum next to the Ganges where 99% of the community work in the tanneries. There is no household water supply, and there are no toilets so open defecation is the norm. People in the village often fall sick with stomach problems, headaches and skin infections due to drinking and bathing in untreated water polluted by the Ganges. Haseena’s husband, Mubarak, works in the Tel Mill Tannery for a meagre wage. When he’s ill, he cannot work and their poverty deepens. 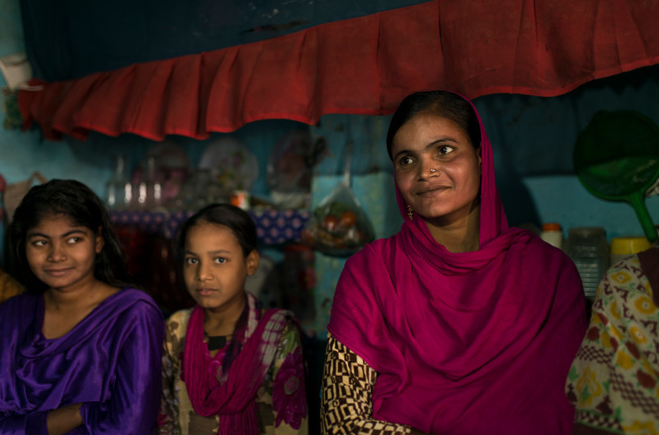 It’s not hard to imagine how Haseena, Mubarak and Zarina’s family’s lives could be transformed with the introduction of clean water and decent toilets. Whether they work in small artisanal communities or large factories, a healthy and contented workforce leads to higher productivity, fewer errors, reduced absenteeism and overall enhanced economic benefit. Inevitably, the supply chain will be more resilient and reliable for the parent brand. Ultimately, businesses stand to benefit from investments in water, sanitation and hygiene improvements in the workplace, supply chains and in the communities where workers live. Forward-thinking clothing brands can conceptualise the broader business benefits – financial and reputational – created through investments in water and sanitation facilities for their employees. Other brands must now catch-up as these vital facilities become embedded in responsible supply chains management. Access to water is a human right after all. There are 4 million garment factory workers in Bangladesh, and 12 million in India. Women make up 80% of the workforce. WaterAid’s HSBC-funded ‘Sustainable Supply Chains Programme’ will improve the lives of approximately 11,000 people working in the garment industry in Bangladesh and India.